Television scholars (to the extent there are such people) say that television became commercially viable in 1949. Before then, television broadcasting was considered experimental. That’s not to say that experimenting ceased in 1949; the technologies for delivering television have improved immeasurably in 60 years. Some of those changes have been obvious. You may remember when black and white gave way to color or when mono gave way to stereo. This year, analog gives way to digital, and standard definition starts to give way to high definition. But many other more subtle changes have happened over the years, the kind you don’t notice until you look back and see how things used to be done. 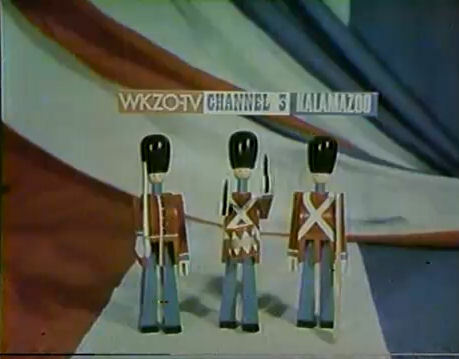 CBS aired a patriotic musical extravaganza on July 4, 1977, and somebody in western Michigan recorded it. They also captured a news update, some commercials, two promos, a public service announcement, and a station ID from WKZO, the CBS station in Kalamazoo. Watch this clip to see them. Doesn’t this seem slow-paced and rough around the edges? You might think that Kalamazoo was some backwater little town with a TV station on a shoestring budget, but Kalamazoo, with nearby Grand Rapids and Battle Creek, is a top-50 media market. That’s hardly small potatoes. This clip is actually typical of how TV was done across the nation in the ’70s. In 1977, network television was delivered to local stations by a system of coaxial cable and microwave radio relay, the nation’s first broadband network. But bandwidth was limited, and picture and sound suffered enough that local programming looked and sounded crisper than network programming (unless you lived in New York or Los Angeles, where network programs originated). Strangely, NBC sounded a bit different from ABC, which sounded different from CBS; perhaps they all tweaked their audio processing a bit differently. Network picture and sound are of consistently good quality today because programming is delivered via satellite. Also, it may look like Morton Dean is sitting in the dark, but he’s actually sitting in front of a big green wall. A technology called chroma key lays a second video or image over everything colored green. Here, a slide with “CBS News” on a black background is chroma-keyed in. Morton had to be careful not to wear anything green or it would disappear. Chroma key and a "super"
Notice the thin white border around Morton’s head? That’s called a halo, and it’s created when the lighting isn’t just right. You used to see the chroma-key halo effect all the time in the 70s, but today engineers have lighting down to a science, eliminating haloing. Chroma key is one old technology that’s still around – TV meteorologists everywhere stand before blue or green walls to deliver their forecasts. The Newsbreak graphic is superimposed over Morton and the slide. Plain text was superimposed using a character generator, a computer that could display text on TV. A company called Chyron (kye-ron) led the way in this technology, so much so that everybody in TV called any character generator a Chyron. 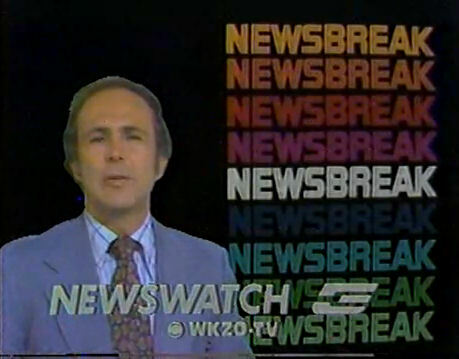 The Newsbreak graphic, being animated, may have been created in some other way. Here’s another example of a character generator at work, this time generated by WKZO. "More news later on this CBS station." 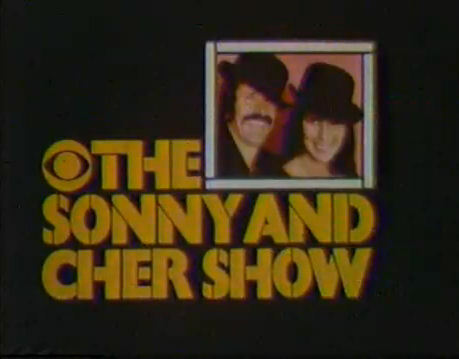 Next, CBS showed a promo for the show it was about to air. 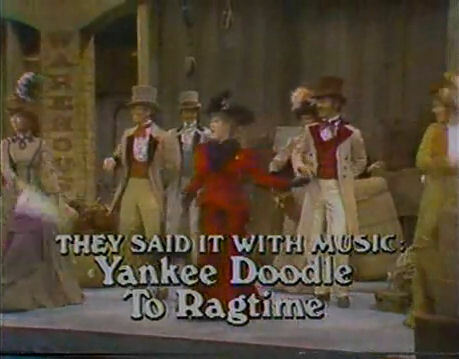 Musical extravaganzas like this are long gone from commercial television. Nobody misses them. The text on the screen could have been produced with a Chyron. 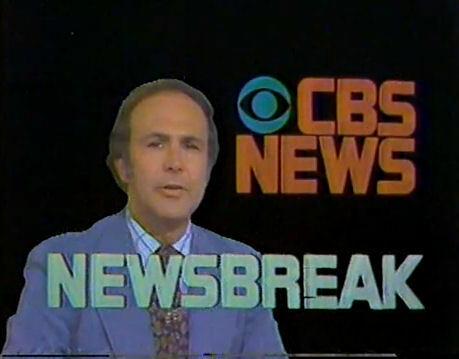 Then CBS showed its logo, which was always the signal to CBS stations across the country that the network was going to let them take over for a couple minutes. Stations sold commercials, or spots as they’re called in the biz, to air during these times, and apparently WKZO had cut a deal with Burger Chef. Did you notice how the sound level distorts and there’s a rumbling sound on the soundtrack? Did you notice how, at the end, the Burger Chef logo seems to wobble around a bit? These are all hallmarks of film. Like most stations in the 70s, WKZO certainly used a film chain, a machine that connected several film and slide projectors to a TV camera, to show movies and spots. So the film for this spot was threaded into one of the projectors in the film chain and when the time came, the engineer pressed a button to start the film playing. By the mid-1980s stations had switched to videotape, and today stations have switched to digital media. 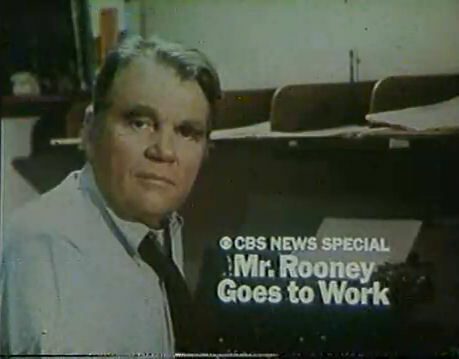 After the Burger Chef spot, the WKZO engineer switched the film chain to point at a slide projector that showed this slide of Andy Rooney. Such slides are called telops. Did you hear the “tak” sound just before the announcer started to speak? That was the switch that opened the microphone. An announcer was actually sitting in a booth reading the copy for this promo live. Stations don’t use live announcers anymore; everything is pre-recorded. "WKZO-TV Channel 3 Kalamazoo, it's 9 o'clock." The announcer even read the station ID live. Then as now, the FCC requires television stations to identify themselves at the top of each hour by giving their call letters and city of license. Stations can give their channel number in between if they want, and WKZO always wanted. Stations can give their ID either visually or verbally, and in the 70s most stations did both. Today, station IDs are snuck in as graphics in the lower third of the screen during the first few seconds of a show, and you probably don’t even notice them. In the 70s, when a network pre-empted a regular show, they always told you. Today, the networks fiddle with their schedules all the time. We almost expect our shows not to be on anymore! Accordingly, pre-emption notices have pretty much disappeared. Here, CBS used telops for each preempted show. 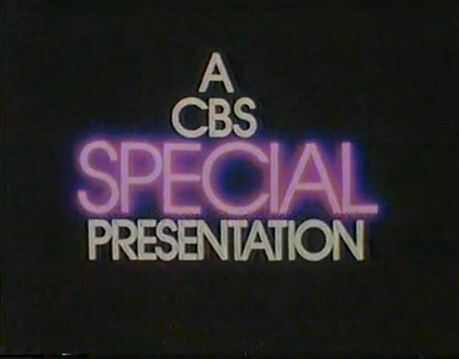 If you grew up in the 1970s, you probably totally dig the “CBS Special Presentation” bumper. Each network had some sort of graphic or animation that heralded a special program, but those, too, are gone. Kids nationwide hoped for a Charlie Brown special. These three minutes were routine television business that most people hardly noticed. But they say a lot about how television used to be done. Burger Chef… never heard of that one. But I would swear the dad in that commercial is James Cromwell. Burger Chef was a national burger chain started here in Indianapolis in I think the 60s. They were bought out by Hardee’s in the 80s and that was that. When I was a kid, I wanted to be a TV staff announcer. I liked the idea of having my voice come out of the TV speakers like that. By the time I was old enough, all those jobs were gone! Thanks for sharing the CBS clips. They remind me of a time when broadcast television had a human touch and was worth watching. Glad you enjoyed this! You’re right, there was a human touch to TV back then. 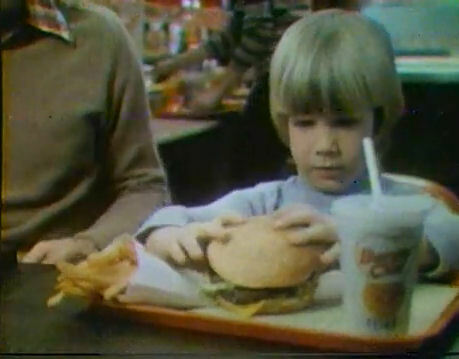 Enjoyed the Burger Chef ad mostly. I agree that is Cromwell enjoying that “Super Chef”. And that kid appears to be working on a “Big Chef”, (where is he now?). We had original golden arches McDonalds, Burger King, Burger Queen and Burger Chef here in New Jersey. Not to mention, KFC and Gino’s Fried Chicken Restaurants. There is an actual Burger Chef building in tact, converted to a Diner not one mile from our house. I mean to shoot some pictures of the Architecture some day. As well as preserve what’s left of the other mid-century relics we have left. I’m glad that Burger Chef building is intact. Indiana used to be lousy with old Burger Chef buildings, but one by one they’re disappearing. I’m not aware of any of the original-style buildings left. Here’s a great site that’s a few years old now that shows the state (then) of some of Indiana’s old Burger Chef buildings. The building ID’d as at 86th and Ditch Rd. in Indianapolis was torn down in 2009 to make way for a new Walgreens. Here is a good page documenting BC’s in Southern NJ, I’m reminded we had two locations here in the central Capitol region. South Broad Street, Across from Independance Mall Shopping Center – Hamilton Township, N.J. (was also an Arthur Treachers Fish & Chips and now a Bank). Thanks, now I’m wanting to have some Fish & Chips! Man, I miss Burger Chef. It retains a prominent place in my memories of childhood. I lived in the Lafayette, Indiana area at the time. There were several Burger Chef locations in Lafayette in the 1960s and 70s and my family visited them all at one time or another. Many of the original buildings remain and are currently in disguise as other businesses. Imagine my surprise a couple or so years ago when I discovered that at certain locations Hardee’s included on their menu for a limited time the Big Chef sandwich (although I think Burger Chef spelled it “Big Shef”). Wow, what a trip down memory lane! I somehow forced my son, who was probably about 11 at the time, to try one — and he loved it. He frequently asks to return to Hardee’s for a double Big Chef meal. He has no idea the secret pride that wells up inside his father when that happens. It’s funny how we feel nostalgic over such trivial and seemingly ridiculous things. By the way, the Hardee’s (affectionately called Stardee’s at my house) I’m referring to is in Lebanon, Indiana, and they’ll usually make a Big Chef for you upon request, even though it doesn’t always appear on the menu. Yum. Cameron, thanks for sharing! It’s true, these little bits of our childhood that seemed common and inconsequential at the time do carry great weight. This is just too wierd. I’m working the overnight shift in Master Control at the very TV station in the clip (now WWMT.) I stumbled on this site while feeling nostalgic and Googling information about Burger Chef. Now everything is digitially recorded..we still get some programming and commercials via satellite, internet-base electronic delivery, or even tape, but it’s all dubbed into the computer system for playback. We actually run four stations from this location, the CBS affiliate here, an ABC affiliate based in Lansing, MI, and two CW stations. I’m a recent transplant to TV from radio..I’m amazed at how primitive things were done just a few years ago. Steve, that is quite a coincidence that you read this from WWMT’s Master Control! Can you imagine how much manual effort was required to run your station in 1977? I didn’t know how much had gone to digital distribution, but I shouldn’t be surprised. I did some radio in the 80s and 90s — I started cueing up actual records, moved to carts, then to CDs (in these funky cartridges). Selector was spitting out paper playlists in those days. I know that today everything is on a hard drive. We would have called it automation in my day. I have observed how TV stations have consolidated Master Control. We have LIN-owned WISH here in Indianapolis and all programming for their Indiana stations (WANE in Fort Wayne and WTHI in Terre Haute) runs from here, and maybe other stations, I don’t know. My grandparents lived near Dowagiac, MI, and with their big antenna they picked up WKZO-3, WUHQ-41, and WOTV-8. I watched a lot of WKZO as a kid in the 70s and early 80s. The guy who voiced the PSA and the WKZO ID in the clip above — he was THE voice of WKZO. It would be great to know his name. Jim – Thanks for this blast from the past. I worked for WKZO-TV News in 1977. I was their first female reporter and anchor, in a time when few stations would hire women. The station got letters and phone calls telling them to fire me for “taking a man’s job” as well as letters and phone calls from many people who said “it’s about time.” It’s always interesting to look back on things and gain perspective. I was crusing the net and happened to see and read your comment regarding WKZO clip. Hope this email reaches you so that we can chat. Pat, thank you for visiting! I probably watched you a time or two back in the day when I visited my grandparents in southwest Michigan. I remember when women started appearing on the news. I lived in South Bend, so I watched Rebecca Marr on WSBT and Jennifer James on WNDU. It’s hard to believe now that this ground had to be broken, especially since today it seems like there are more women than men reporting and anchoring. Wow, did THIS bring back memories! And how interesting! It’s gotten to the point that some households need converter boxes to get certain stations in HD, like I need a box to get BBC America in HD. Or I can’t view it. I remember when you needed a converter box to get HBO or just cable!! I never heard of High Definition tv until two years ago! But one thing has remained constant….the amount of commercials shown! There are actually more commercials shown today! Old shows have to be cut back in reruns to get today’s commercial load in. This was within the last months of the audio on network TV feeds in much of the country being “lo-fi” telco with frequency response at 100 Hz-5 kHz. By early February 1978, video and audio transmissions across the nation would be “diplexed,” so the rest of the country would get the same crystal clear 50 Hz-15 kHz audio as heard in NYC and LA. I remember when it switched. I was 11. I recognized that the audio quality had improved — but I rather liked the “pinched” audio. It’s strangely comforting to hear it on clips like this one. And besides the matter of audio, different TV stations, networks and production companies had different film chains/slide scanners. Prevalent among those were RCA’s TK-26, TK-27 and TK-28; General Electric’s PE-24, PE-240 and PE-245 (the last-named carried over to Harris/Gates after GE sold its broadcast equipment division to Harris Corp. in 1972); and COHU. Plus low-budget cameras that could be used for both live studio and telecine, such as Philips/Norelco. It can be said one could tell which brand of film chain was used by the quality of the images presented. I’m sure a trained eye and ear can identify many such things in TV from days gone by! The video is gone. Is it posted anywhere else or can someone re-up it? I can still see the video, though unfortunately Dailymotion (the site where it is hosted) has placed it behind a commercial. The CBS “Bong” on the hour was created by a tuned bar in a sound proof box being plucked by a rotating finger turned by a small motor that was started by the Network’s “Master Clock”. This tone was feed to both CBS Television Network and CBS Radio Network Feeds from the control rooms in New York. I figured the tone was automatically generated — thank you for explaining how! It’s funny how that sound, which was just part of the background noise of life back then, is so cool to hear now. Anyway, 1977 was a little before my time (I was born in 76) but I definitely remember and appreciate the slower pace of TV in the 80’s, the old station identifications, and definitely the “CBS Special Presentation” before Charlie Brown cartoons! Those were the days! Out here we still have Hardee’s, but they’re the same as Carl’s Jr. down to the commercials. Or at least I think the commercials are still the same; I hardly watch TV anymore! SO glad they’ve gotten use of the tobacco drug off TV and other places. Tobacco kills SO many people (innocent people, too, who breathe toxic tobacco smoke) and NEVER should have been advertised or even shown on television! The WKZO-TV booth announcer was Rick Weronko (pronounced Veronko). The mystery is solved! Thank you for chiming in. Rick Weronko was a multi-talented broadcasting professional; he covered all the bases! Sadly, Rick passed away in August, 2013. SO glad that illegal advertising of the ILLEGAL TOBACCO DRUG is gone from broadcast media! The clip really takes me back. I was a part-time booth announcer for a station in Indianapolis during the 80s. As in your clip, I would do :10 reads over a static slide. Station IDs were read over a static slide, and later I read over an animation. We weren’t the CBS affil, but I remember well their sound from the hourly bing to the animation sounders. CBS radio had a very distinctive sound too. Thanks for posting this! I miss the distinctive sounds the networks used to have! How cool that you announced in Indy; that’s where I live now. Long-time reader of your blog and Curbside Classic posts. Just stumbled across this posting, I grew up in the 80’s, and love perusing vintage TV commercials and clips like this one. Very interesting “slice of life” showing how things were back in mid-late 70’s America. Thank you for sharing! Awesome! Thanks for finding this post so deep in the archives!